The house that is now Number 7 Pullins Green is the right hand house in the pair of houses which look like they may have been a single house at one time. There is certainly a strange arrangement with the front door of number 7 beneath one of the bedrooms of number 5. We have heard that the two houses may have been one house at some time in the past. Certainly the appearance of the two houses is very similar to the front profile of either number 11 or 13 Pullins Green. If it were true that the two houses were once combined then it would explain the strange arrangement of front doors and might indicate that the houses was built a lot earlier. We have not found any evidence to help clarify its early history. We haven’t seen the deeds of the house so we don’t know when they were built nor able to confirm whether they were ever one house. They were both there in the 1840 Tithe Survey when they were two separate houses. Number 7 was owned and occupied by John Powell. John Powell – the 1841 census confirms that John was living there with his wife Elizabeth. It also shows John was living on independent means. We know from John’s will dated 29th December 1839 that he was a tailor who had moved to Thornbury from Compton in Almondsbury. The will shows that John owned a considerable amount of property. He refers to twelve properties in Berkeley, two in Thornbury and one in Compton. In Thornbury John owned a freehold property in the High Street (later known as 23 High Street) which was occupied by John’s son, George. The land tax records show that John had acquired this house about 1826. John also owned a house and garden in ‘St John Street’ where he was living (which later became known as 7 Pullins Green). All the property was left for the use of John’s wife, Elizabeth, during her lifetime. John appointed several trustees including his sons, George, James and William. After his wife’s death, the trustees were empowered to dispose of the property except the house in St John Street which left to their daughter, Elizabeth Owen during her lifetime. Profits from the property was to be distributed between John and Elizabeth’s sons, John, George, James and William, their daughter, Dinah (the wife of Thomas Barnett) and John and Emma Jenkins (the two children of their late daughter, Sarah who had married John Jenkins). In a codicil to the will John mentioned that he had advanced £21 to his grandson, James, towards his expenses of going to Canada and this had to be taken out of his son John’s, share. John died on 13 June 1843 aged 80 years. Elizabeth died 2 April 1850 aged 80 years. They are buried in St Mary’s Churchyard. Emma Powell is also buried there – she died in 1837 aged 26 years. The 1851 census shows that John and Elizabeth’s widowed daughter, Dinah Barnett, was living in the house. Dinah Barnett – the 1851 census shows the house was a lodging house run by a widow, Dinah Barnett. Dinah was aged 43 and born in Compton in Gloucestershire. She had two children living with her: Clara and Matilda aged 14 and 13 respectively. Both girls were born in Dursley. Dinah was the daughter of John and Elizabeth Powell who had owned the house previously. Dinah married Thomas Lippiatt Barnett in the Clifton area on 1st February 1836. Thomas was the son of John and Sarah Barnett who lived at what became 49 High Street in Thornbury. Thomas was born in Thornbury on 17th February 1805. In 1841 Dinah had been living in Dursley with her husband, Thomas. Dinah had moved to Thornbury after 1843 when her husband Thomas was buried in Thornbury on 3rd March aged 37 years. He is shown in the Trade Directories as providing a van “for passengers and luggage from Thornbury to Berkeley and Dursley every Monday, Tuesday, Thursday and Saturday.” He also operated a van to Bristol each day. He was buried in St Mary’s Church. Matilda was also buried there in 1865 when she was aged 26 years. She was living in Bristol at the time of her death. The 1856 trade directory lists Dinah as a dressmaker living in St John Street (which included Pullins Green). We do not know what happened to Dinah. James Bevan – the 1859 and 1862 Rate Books show that the house was then owned and occupied by James Bevan. The 1861 Census show the house was owned and occupied by James, a journeyman carpenter and his wife, Elizabeth. James was born in Thornbury on 26 October 1810, the son of James Bevan (Junior) and his wife, Ann. We have learned from a family tree on the “Ancestry” website that James Bevan married Elizabeth Pearce but we have as yet been unable to trace this marriage. James and Elizabeth Bevan had at least seven children who were all baptised in Thornbury. These were; Elizabeth (baptised 24th November 1831), Louisa (baptised 22nd September 1833), Anne Pearce Bevan (baptised 30th April 1837), Edward Pearce Bevan and Fanny Bevan (who may have been twins as they were both baptised 25th July 1841) and finally Jane Bevan (baptised 27th July 1845). The 1851 Census shows that the family already lived in the Pullins Green area, possibly in what is now 4 Pullins Green. At that time James was 40 years old and a carpenter. His wife Elizabeth was 44. Their daughter Elizabeth then aged 19 was a staymaker and the youngest child, Jane, was only five and still at school. Elizabeth Bevan was said to be a fundholder in the 1861 Census. She was aged 59 and this Census says that she was born in London. Their niece, Louisa Stinchcombe, a scholar, aged 11 from Berkeley was also living there. “Louisa” appears to be Matilda Louisa Stinchcombe who was born in Stone near Berkeley and was the daughter of Henry Stinchcombe a music teacher, who died in 1853 aged only 40. Elizabeth Bevan died in 1869 aged 62 years. In the 1871 Census James was sharing the house with another family. He had his 10 year old niece, Emma Prewett living with him. Emma was the daughter of Charles Prewett. Her mother Emma (nee Bevan) had died in April 1861 when Emma (baptised Ada Emma Prewett) was born. The family lodging in the house is that of Henry and Charlotte Clutterbuck, although Henry was not at home on the night of the Census. He was a coachmen so he could presumably be ‘on the road.’ Charlotte was born in Thornbury in 1843, the daughter of Thomas Morgan, chimney sweep and his wife, Charlotte. She married Henry in Bristol in 1863 and they now had Henry aged 6 born in Bristol, and Ernest aged 3 and Percy aged 11 months, both born in Thornbury. James Bevan died in 1874 aged 64 years. Elizabeth Bevan married William Lee in Bristol on 31st January 1853. We have learned from a family tree on the Ancestry website that Elizabeth and William Lee lived in the Tower Hill area of Bristol and then emigrated to Victoria, Australia on 25th March 1853 aboard the “Genghis Khan.” They went to live in Wellington Street Collingwood and at first worked for Mr J Hind to repay their passage. Elizabeth lived to be 95 and died in Williamstown on 25th November 1905. Ann Pearce Bevan died young and was buried in Thornbury on March 12th 1843. Edward Pearce Bevan was baptised 25th July 1841. He was buried on 25th February 1843 aged one year and seven months. Fanny Bevan died and was buried 25th February 1843 aged four years. Jane Bevan was baptised 27th July 1845. She was living with her parents in the 1851 Census but sadly died the next year and was buried on 18th April 1852 aged six years. At the time of the 1926 Rate Book the owner is being shown as the Representatives of George Mansell Williams who had lived at 9 Pullins Green. In March 1936 the Western Daily Press published a notice of sale of this property as part of a sale of several Thornbury properties which had been owned by George Mansell Williams. The notice said that the property had been ‘until recently’ occupied by William Short. 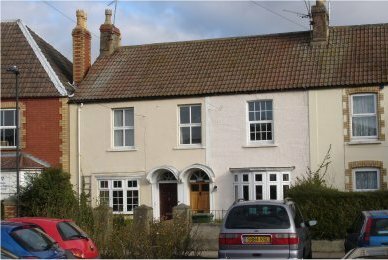 It described the property as containing: on ground floor, entrance hall, front sitting room, kitchen, pantry, scullery with boiler and good pup and soft water, coal house and usual offices. On first floor, front bedroom, back bedroom and dormer attic over. A good strip of garden at the rear.